Wild mandrake, aka American mandrake, is a North American species of perennial forest plant that rises in early spring but has a relatively short life cycle. It is commonly known as mayapple (also may apple), although the “apple” component refers to the fruit that matures in summer and not the flower that appears in May. All parts of the plant are toxic, although the root has a long history of use by Native Americans who taught European settlers how to make infusions for topical use. Today, wild mandrake root is the source of a compound called podophyllotoxin that is used in the pharmaceutical industry for various purposes, most notably in wart creams and salves. Podophyllum peltatum is a spring ephemeral, herbaceous perennial plant in the family Berberidaceae. The stems of the plant reaches up to 30–40 cm tall, sprouting 2 (or occasionally 3) palmately lobed leaves. The leaves grow up to 20–30 cm diameter with 5-9 deeply cut lobes on reproductive individuals—or one peltate (umbrella-like) leaf on sterile individuals. Podophyllum peltatum produces one single white flower that blooms 3–5 cm diameter, with six (or on rare occasion up to nine) petals. It is produced at the axil of the two leaves (if the plant is three-leaved plant it is produced between the upper two leaves). The flower matures into a yellow-greenish fruit 2–5 cm long. The plant is widespread and appears in clonal colonies in open mesic woodlands. Individual shoots are often connected by systems of thick rhizomes. As with many kinds of wild plants, the flower provides sexual reproduction in this case with a long distance dispersal; while the rhizome provides asexual reproduction by allowing for the formation of dense circular clones. 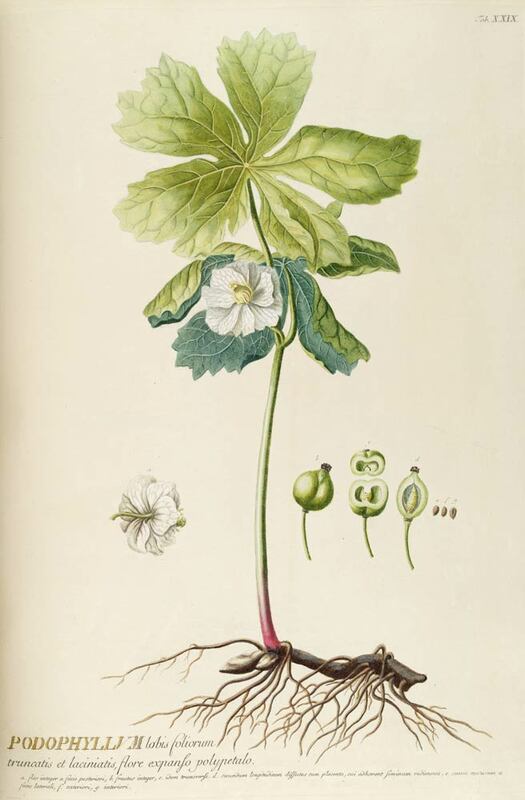 One of the mandrake's common name is mayapple. Though more correctly it is the flower that appears in early May, and not the fruit or "apple". The fruit is produced in the early summer but ripens in later in the summer months. Another common name, wild Lemon, is a given because of the flavor of the fruit. Podophyllum peltatum is native to deciduous forests in of eastern North America. Grows well in moist open woodland and also succeeds under beech trees in shade or part shade. Prefers a moist peaty or leafy soil. Sow seed as soon as it is ripe in a cold frame. Sow stored seed in a cold frame in early spring. The seed germinates in 1 - 4 months at 15°c. 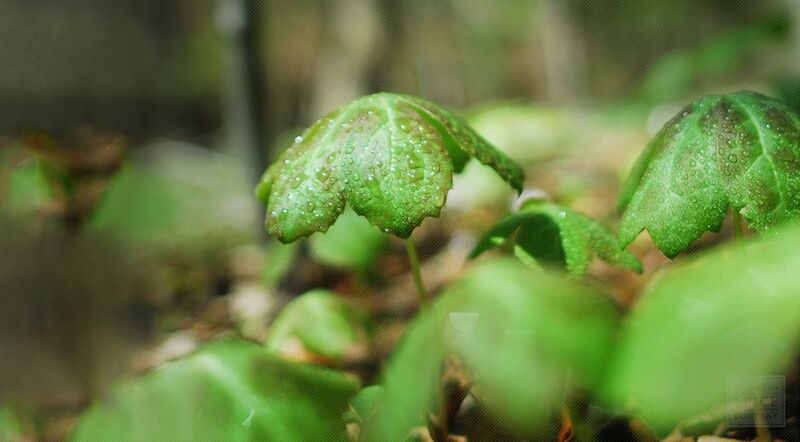 Transplant out the seedlings into individual pots when they are large enough to handle and grow on in a shady part of the greenhouse for at least 2 growing seasons. Plant them out into their permanent locations in the garden in winter when the plants are dormant. Division can be done in March/April. The root is harvested in the autumn and either dried for later use or the resin is extracted. Store dried root pieces in an airtight container in a cool, dry place. The ripened fruit is edible in little amounts, though when consumed in large amounts the fruit is poisonous. The rhizome, foliage and roots are also poisonous.